Its downstream petrol industry has always been closely allied to that of neighbouring Belgium. In the 1960s the only difference was the presence of the German (ex-Saar) company Frisia, but when that was sold to Gulf there were no Luxembourg operators not also found in Belgium. Occasionally there have been small Luxembourg independents such as Alca in the 70s and Luxoil, which operates a single station near the German border in Wasserbillig, today. In recent years some German names have also crossed the border including DEA and the tiny independent Wolters as their stations in the Mosel valley have lost sales to their cheaper neighbours in the Grand Duchy. 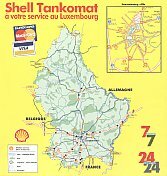 In 1998 when BP sold its Belgian operation it retained a presence in Luxembourg, as BP's busiest single station in Europe is a motorway service area in Luxembourg. Enlarge The map left pre-dates October 1950, as it was issued by Standard Luxembourgeoise des Pétroles SA, but is post-war as it includes the location of the American military cemetery. Lacking any form of cover, it was produced by Ed. Huss & Cie. at 1:200,000 and is notable for the reverse colours in the Esso logo. 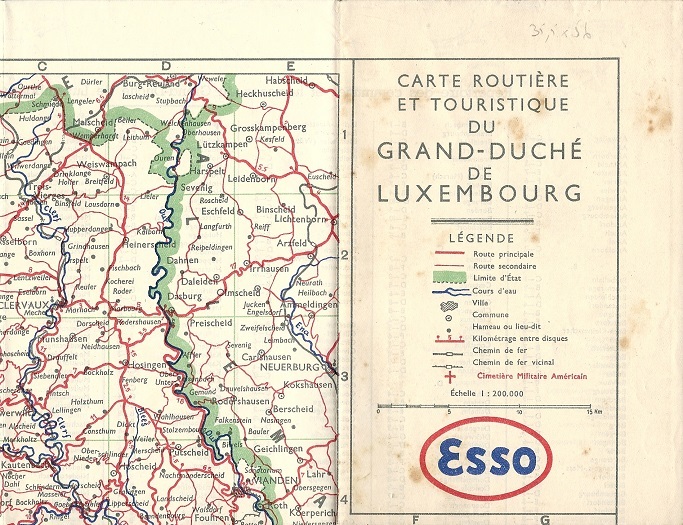 A late 50s or early 60s map, right, was "Offerte gracieusement par Esso Luxembourg S.A.", but produced for them by the national tourist office. The map measures 45 x 36cm. Fina's 1958 issue was simply the 1:200,000 Michelin "yellow" map no. 8 of Luxembourg, overprinted in two colours on the front & rear to show that it had been distributed by Fina. These three maps probably all come from the early 1970s, when the price differential with France was at its widest. The undated Elf map, like the earlier Esso ones, has no cover. Produced by the local firm of Jean Henzig at 1:150,000 it marks Elf stations with a simple lollipop; 7 of its 18 locations were clustered near the French border. The Total map - drawn to a scale of 1:150,000 - dates from 1972. The side shown is in French but the reverse is in German, the country's other official language, saying "Strassenkarte Luxemburg". The Texaco map shown right is considerably younger, dating from 1990. 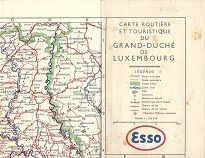 It is a 1:100,000 Geocart map pasted into Texaco card covers; one side is in Dutch (shown) and the reverse in French, which suggests that it was created mainly for the Belgian market (as if it were for Luxembourg it would be in French and German). There is also a small French language booklet of practical information and tourist sites pasted into the cover. 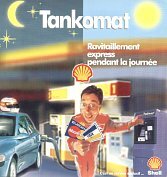 The French language Shell leaflet printed to promote their automated "Tankomat" stations is much more recent, dating from 1998 and was printed by Inter Communication. The cover opens down the middle to reveal the same basic picture, but is die cut around the pecten. 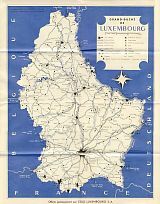 The rear of the leaflet has surprisingly detailed map of Luxembourg, identifying wooded areas as well as Tankomat locations.